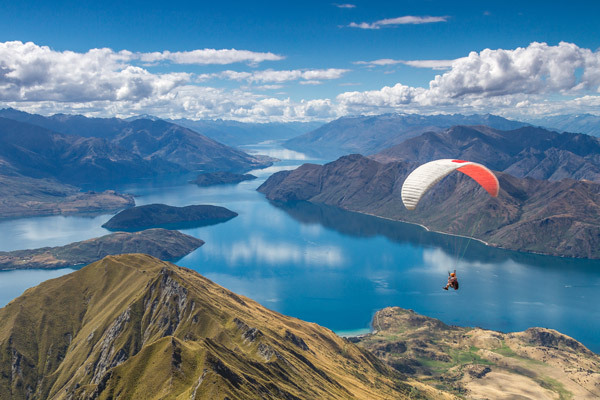 A land of rolling tundras, soaring mountains and natural landscapes that boggle the mind, New Zealand is an incredible location that will capture your imagination with new wonders and sights around every corner. From the top of the north island to the tip of the south, this country exhibits a natural landscape so picturesque that is has become the icon of many Hollywood epics over the past few decades and a boon for tourists seeking an unforgettable wilderness experience. Home to volcanoes, national parks and cosmopolitan cities, the north island is the perfect starting point for your New Zealand adventure. 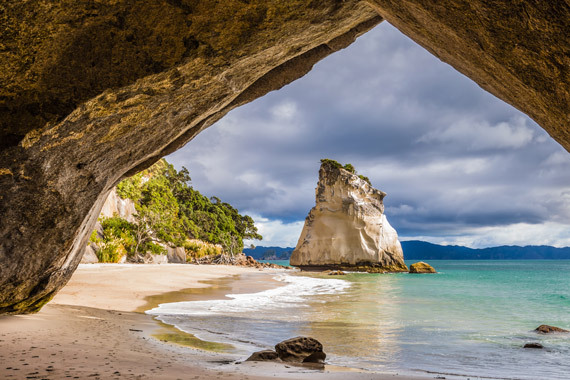 Stretching From The Bay of Islands in the north to ‘Windy’ Wellington in the South this land is a scenic mixture of great lakes, sandy beaches and snow capped mountains. 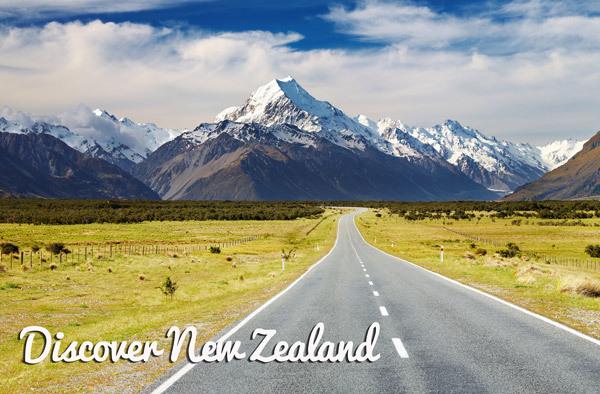 Starting in the city of Auckland, the north island route is a camper vanning paradise with all of the best attractions accessible via an excellent modern road network. Explore the many beautiful black soil beaches and waterfall walks around Auckland’s outskirts or take in the sites of the city itself. The budding multicultural atmosphere and friendly locals make for a great city experience with an eclectic collection of museums, restaurants and other attractions to satisfy all interests. On the east coast lies the Coromandel Peninsula, home to incredible seafood, fishing adventures, thermal beaches and cozy, laid back towns. This part of the north is one of the most popular holidays destinations in the country and can be accessed by following routes east that hug the coastline from Auckland. 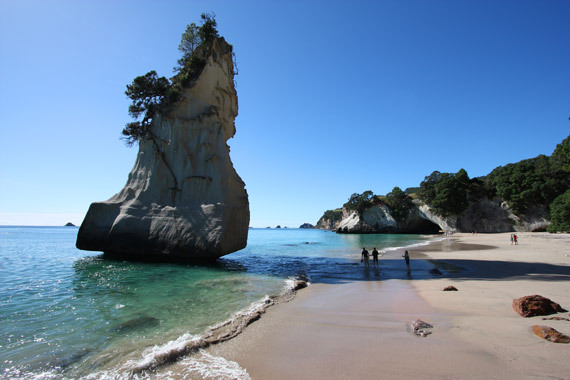 Travelers will be treated to incredible mountainside views and wide winding roads that traverse both sea and sand with the various national parks and Cathedral Cove posing as the main attractions in this region. Get lost for hours in the natural beauty of ancient rain forests or watch the tide come in from one of the many secluded beaches in the area – choose your own experience when in Coromandel. For a special experience check out Hot Water Beach; an unassuming natural wonder that combines surf and sun with geothermal activity. Hire a shovel for $5 from the local eatery and dig your own thermal bath in the sand just alongside the main beach. Temperatures vary from 28 -70 degrees Celsius so be careful when choosing your place, and if you’re feeling peckish, the same cafe delivers pizza direct to your spot making for a slightly indulgent experience. Following the road south, travellers will find themselves entering the neighboring regions of Waitomo and Waikato, home to the fictional creatures of Middle Earth and the not so fictional creatures of the Waitomo Caves. Easily one of the biggest tourist attractions of the region, The Hobbiton Movie set stands as a monument to the award winning Lord of The Rings trilogy filmed in the region almost two decades ago. Restored to a fully interactive tourist experience, visitors to the region can embark on their own adventure exploring the movie sets and learning interesting facts about the making of the films and the work involved in bringing Middle Earth to life. 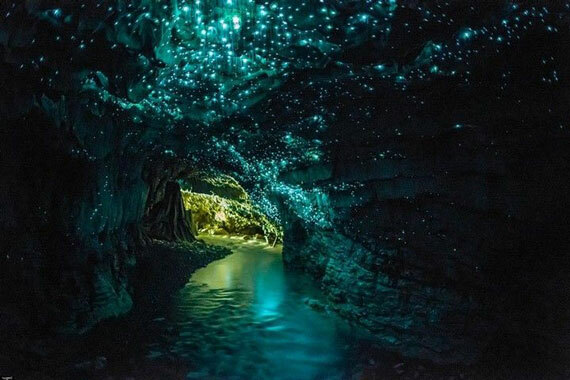 Just as magical if not more so are the Glow Worm Caves of the Waitomo region. First discovered more than a century ago, immense networks of underground caves intersect the area under the unassuming farmland of this region and are home to millions of Glow Worms that provide an unforgettable experience for those adventurous enough to explore. Tour company’s regularly run trips through the caves where travellers can experience tire rafting, abseiling and paddling through the extensive cave systems. While your in the area why not book a Middle Earth Trilogy experience? Packages are available to visit the Waitomo Caves, Hobbiton Movie Set and Te Puia Geothermal Sites for great rates. See more here. 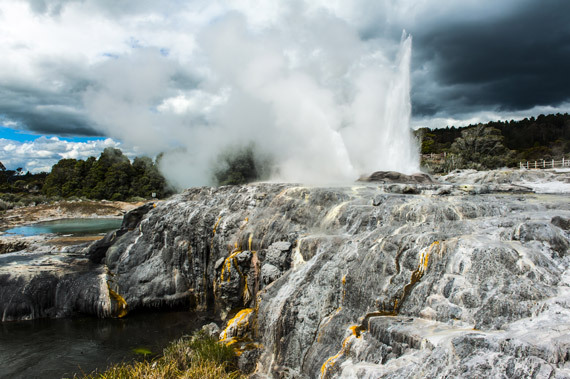 Home to sacred Maori traditions and incredible geothermal geysers, Rotorua is the indigenous cultural centre of the North Island and a sight to behold for nature lovers and adventure seekers alike. 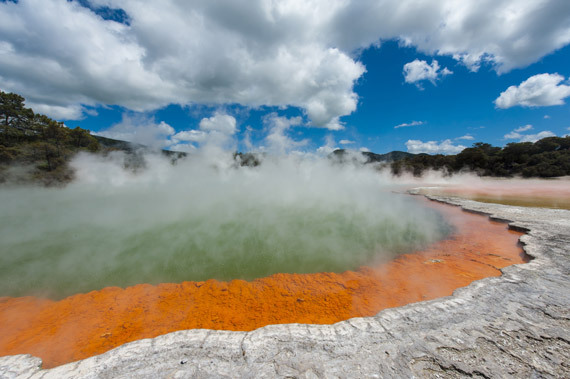 Visitors can discover the roots of Maori culture and tradition at one of the various reservation sites such as Wai-O-Tapu, Whakarewarewa and Waimangu and be dazzled by the Craters of the Moon and Hell’s Gate (Tikitere) goethermal sites that fringe the area. The geyser flats in this region have been described as ‘other-worldly’ and were once home to the 8th wonder of the world, The Pink and White Terraces before they were lost in the eruption of Tarawera in 1886. Te Puia has the best collection of natural sights and operates tours and cultural experiences daily. To see more details visit their website here. 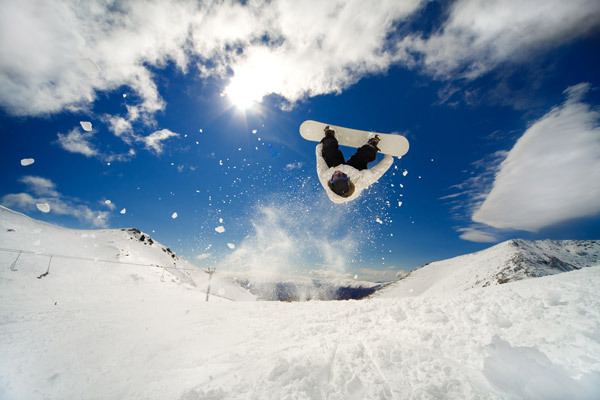 Taupo and the mountainous Tongariro region make up the biggest attractions in the midlands of the north island. The township of Taupo is bordered by the staggering Lake Taupo – often referred to as an ‘inland sea’ due to its sheer size. The lake is roughly on par in area with Singapore and is home to countless water sports and fishing adventures in the area. 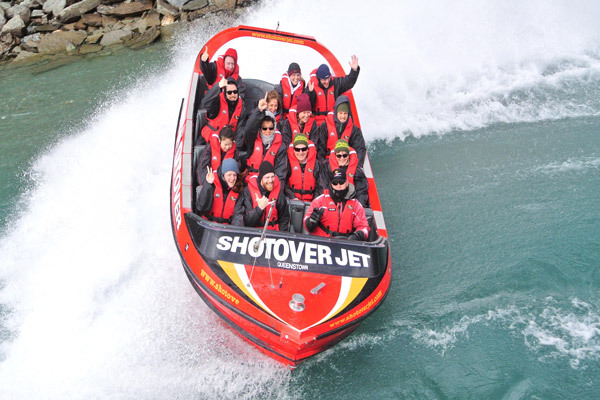 Also a popular camping and skydiving destination, Lake Taupo flows into the nearby Huka Falls which is famous for its ferocious flow (producing nearly 20 million litres a minute) and as a white water rafting/jet boating experience. A half hour south and casting a long shadow across the great lake are the alpine peaks of Tongariro National Park. Twin peaks and another famous filming location for the Lord of the Rings Trilogy, these mountains are truly majestic and offer one of the most breath taking day hikes in the southern hemisphere. Although the hike is relatively safe, it should not be taken lightly as weather conditions can change without warning and ice is present on the peak year round. ‘Windy’ Wellington as it is known by the locals gets its name from the ‘funnel effect’ produced from breezes passing through the Cook Straight into its harbour proper. Although it is currently a contender for the ‘Worlds Windiest City’ there is so much more to this town than the occasional heavy draft. The official capital of New Zealand and home to a bustling cultural and culinary scene, Wellington is without a doubt a gem on the Northern Island’s visitors circuit. It’s harbor side culture and connection to the South Island ensures a boon of visitors and activities all year round, and its Miramar Peninsula stands as a mini-mecca for film enthusiasts who come from all around to visit the famous production facilities; Stone Street Studios, Weta Workshop and Park Road Post which have all played host to some of Hollywood’s biggest productions. For an intriguing experience and deeper look into New Zealand’s lesser known wartime history, be sure to check out The Great War Exhibition in downtown Wellington. Created by Sir Peter Jackson as a memorial to New Zealand’s efforts during The Great War, the exhibition is an incredible interactive production that serves as both a mark of respect to the fallen and an educational experience on the endeavors of the first New Zealand ANZACS.